Is there a way to show only the branch structure in Git? There are a number of tools that show the commits graphically, but in my case the list is so long that it's impossible to see the structure. 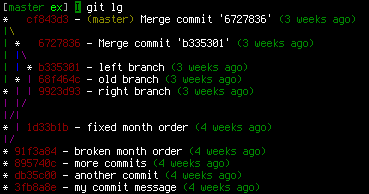 I guess git-log could be the answer, but I can't find any switches that only show the branching commits. This along with "--graph --branches --oneline --all" could do the trick. EDIT: I'm looking for a way to do this in Ubuntu. I am not sure about what you mean by "branch structure". heads = ! "git log origin/master.. --format='%Cred%h%Creset;%C(yellow)%an%Creset;%H;%Cblue%f%Creset' | git name-rev --stdin --always --name-only | column -t -s';'"
Note: Jakub Narębski recommands adding the option --simplify-by-decoration, see his answer. Maybe I'm missing something, but nobody seems to have mentioned gitk --all yet. git log --graph --all --pretty=format:"%Cblue%h%Creset [%Cgreen%ar%Creset] %s%C(yellow)%d%Creset"
(example taken from the above URL). How to get birds eye view of git tree with just branch names, not individual commits? How do I visualise my git repo properly?